Saturday Morning Slam 04-06-13 - WrestleCrap - The Very Worst of Pro Wrestling! Just a guess on my part there – they’ve never hyped a PPV before, and it will be pretty interesting to see if they mention their number one event at all or not. As I’m so fond of saying, one way to find out, so let’s hop right into everyone’s favorite G-rated wrestling progrem! And we’ll start out this week with SMS mainstay Damien Sandow against Ryback. I won’t lie – this isn’t exactly filling me with confidence this week. Still, as long as the SMS Commentary Wheel of Misfortune™ doesn’t give us The Mad Ox, I’m sure things will be ok.
You know, sometimes I feel like the whole goal of this company is to tease me just enough into thinking their product is something I actually enjoy, just so they can think smack me back to their reality like a Bring Your Geek Wrestling Friend Night at the raquetball court. Still, we get Damien Sandow, and he’s usually good for a laugh. Better yet, his best friend, Cody Rhodes’ Mustache, will be at ringside. Remember the last time Cody’s Mustache was on this show? Sadly, Sandow does not get mic time this morning, which means that someone else has to fill our ears, and it’s Maddox, to the delight of no one but about 4 doofuses on the internet who believe that his horribleness is a gimmick. Those same people probably believed that this guy’s horrendosity, which won the Gooker Award, was also a gimmick. I should note that guy won the Gooker Award. Seriously, what am I supposed to call that? The Grabthejunkplex? The Jackoffknife? The Schlonghoist? All I know is that if I’m a WWE Superstar, and someone asked why I wouldn’t want to work with Ryback, this is the first image I’d show. So Maddox sees this, and says, “All the blood flowing to Damien Sandow’s brain right now.” Shew. I was really concerned he was going somewhere else there. Apparently, hanging upside down like that makes him smarter according to Maddox. Did I mention there are people think Maddox’s horrible commentary is a gimmick yet? I’d suggest those people stand on their heads for a while so they can smarten up…or pass out, which would keep them from posting on here. Either way, we win. Some boring ground work leads to Maddox noting that the WWE Universe wants Sandow to feed Ryback more beatings. “Do you even watch WWE?” Josh asks in blatantly annoyed manner. This then leads to discussion of Ryback’s eating habits, which according to Josh, consists of 6-8 LARGE meals a day. You know, we’ve heard a lot about Ryback’s appetite over the last year or so, but we’ve never seen video documentation of this. That’s a shame. As an aside, I know there are people looking forward to Ryback vs. Mark Henry at Mania, but I am thinking an eating contest would be way, WAY more interesting. And it would have for sure been more interesting than the match I am watching this morning. Pretty much nothing happens until Cody grabs Ryback’s foot, and is then drug into the ring by same foot. And that leads to basically nothing other than him staring up Ryback’s backside. The match ends with a Shellshock right before we hit the one-hour time limit on this 30 minute show. 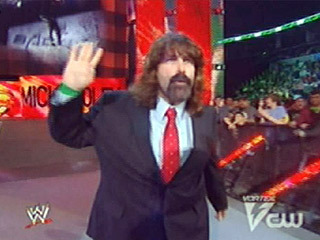 An SMS Spotlight follows in which the amazing, Hall of Fame career of Mick Foley is showcased with…matches made on this show. I bet they didn’t do the same last night at his induction. Unless, of course, Hunter was doing the video editing, in which case they may have. Regardless, Mick sets up our next match, Kane against Cody Rhodes’ Mustache, with Damien Sandow banned from ringside. A moment, if I may, about Cody’s ‘stache. I really feel as though the guy is missing the boat with this. If your gimmick is going to be centered around it, you need to go all the way with it, and grow it to a handlebar dealie. I mean, that’s what’s on your shirt, for crying outloud. Go the full monty, twirl that bad boy like Snidely Whiplash, and change your name to “Nefarious” Cody Rhodes. Match starts with Cody grabbing a headlock on Kane, which is apparently a “great strategy” according to Maddox. And apparently, that IS his strategy, as he spends the first several minutes grabbing several variations of said side chancery, all of which fail, until eventually we go to commercial break. Not sure I’ve mentioned this yet in these reports, but every week we get more or less the same bank of commercials. We get Chuck E. Cheese, we get the Dutch Oven thing, and we get this one, where a punk looking kid is sitting next to some fat woman at a bus stop. So the bus comes, and the woman gets on but leaves behind her purse. The kid looks at it, grabs it, and starts running. Eventually he catches the bus at the next stop and gives it back to her, as “Honesty – Pass It On” flashes on the screen. 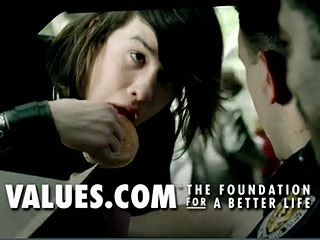 The only reason I mention it is when I am watching Reds games, they show this same commercial, but it’s a longer variation with cops following the kid. When they see him give the purse back, they smile and, no joke, OFFER HIM A DONUT. This would be in the form of a Don’t Try This with Brodus Clay. So I’m never to dance with someone pretending to be my mother while fireworks go off behind me. You got it, Funkasaurus. Back in the ring, Cody keeps working the headlock, as Maddox explains that it is a good lesson for kids to learn about perseverance. He says that while Cody is trapped between Kane’s legs. PSA from RD here: kids, that is NOT a good lesson about perseverance. So we get more headlocks and other assorted stuff that would threaten to put you back to sleep this morning, until the match ends with…something. I think it was supposed to maybe be a big boot or something. Note to SMS producers: you can edit out finishes for reasons other than shots to the head. Eh, show wasn’t great or anything this week. 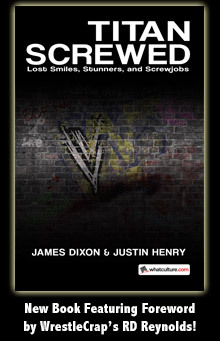 I’d blame Maddox, but really, I think we know what it was missing. 10 Responses to "Saturday Morning Slam 04-06-13"
I demand that Ryback’s suplex immediately be renamed “The Schlonghoist”. Also, if Cody’s mustache really wants to get over, it really needs to grow up into a Magnum TA or a Blackjack Mulligan. That could net him the top spot in the next WrestleCrap Book of Lists! Imagine doing The Schlonghoist to a bear. “Schlonghoist” sounds good to me. 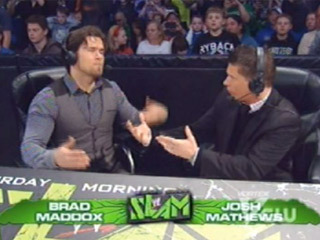 Awww man I was hoping to read some comments trying to defend Brad Maddox. Those are hilarious. 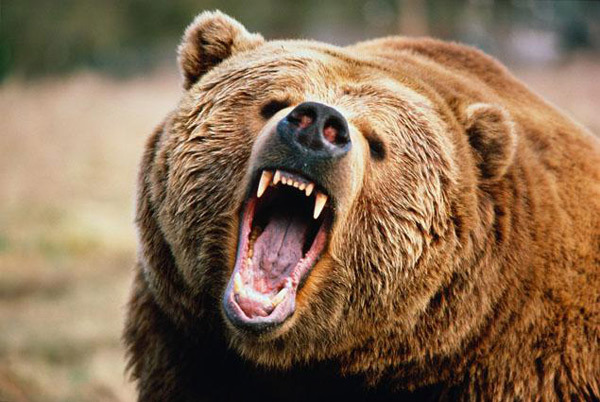 neither of those matches had guys that wrestled a bear. Well, thanks for insulting me in one of your articles for stating a fact. And no, I know Adamle sucked. I also know that Maddox never sucked until he was brought up in this GIMMICK, since I’ve been following his career for years. I’ll know to keep my mouth shut from now on, lest I incur the wrath of RD any further. Sorry, I had a rotten morning, and wasn’t in the best of moods when I posted that. I do, however, if you can find it (WWE took down most of his work in FCW when the referee angle started to cover up any existence of him being a wrestler), Brads work with Richie Steamboat in FCW. While being an airhead who believes he knows everything has always been a part of his character, whatever they have him doing now never was. The guy had a series of great matches with Steamboat.